superdumb supervillain: 1000 Times No! Jasper is more of a "nuh-uh" grunting two year old than a straight-out naysayer. Still, he has a remarkable affection for all things negative as big sister Roo did, a bit more eloquently, before him. (As summer drags on here, I kind of wish she'd go back to the monosyllabic ranting of toddlerdom. Kindergarten must be when girls commence with the yakking that never stops…my lovely daughter starts talking at dawn and I tuck her into bed still talking at night… it's exhausting!) Both of them think 1000 Times No is absolutely hi-la-ri-ous. I think it's the kind of funny that is actually smart in disguise: dude, there are hieroglyphs in there! Plenty of opportunities to discuss other cultures and how their toddlers are just as surly as Americans. Win-win! Best of all, Mr. Warburton inscribed our copy for posterity, so Roo and Jasper can show their kiddos in a couple of decades. That is so cool! 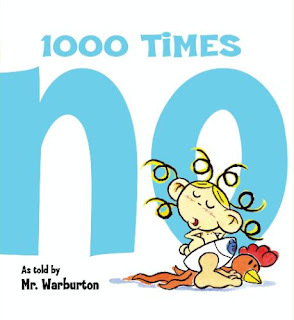 And I love an author who goes by Mr. Warburton. OH how cute! How did I miss this post? It's adorable! Now that you mention it, I can tell it's by the same creator of Codename: Kids Next Door.